Apple earlier today filed a patent royalty lawsuit against Qualcomm, alleging the firm failed to pay owed rebates in retaliation for Apple's part in a Korean antitrust investigation. The claims goes further, however, accusing the chipmaker of partaking in unsavory business practices, from price-gouging to extortion. In its lawsuit, Apple alleges Qualcomm withheld nearly $1 billion in payments in retaliation for cooperating with law enforcement agencies. Specifically, Apple cites the Korea Fair Trade Commission's probe into Qualcomm's business practices that resulted in an $854 million fine in December, the largest in the agency's history. 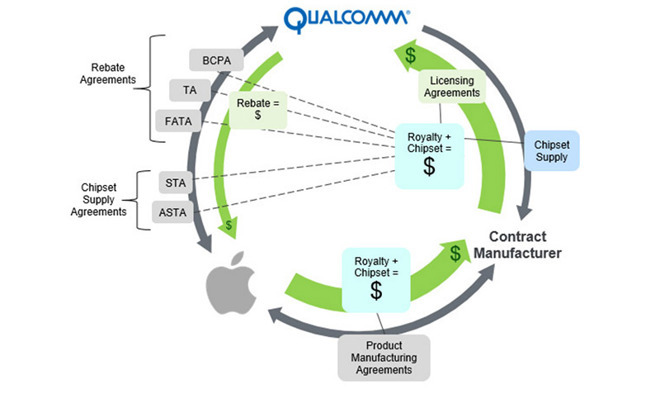 According to Apple lawyers, Qualcomm used its "monopoly power" to flout FRAND (fair, reasonable and nondiscriminatory) patent commitments by charging hefty royalty rates on standard-essential patents relating to cellular communications standards. In addition, Qualcomm refuses to sell chipsets to manufacturers until they first license the SEPs, often at "extortion-level" rates. Since 2011, Qualcomm has conditioned billions of dollars in rebates on "exclusivity or de facto exclusivity from Apple," the lawsuit reads. With the KFTC investigation, however, Qualcomm added yet another condition to payment. Qualcomm has withheld the required contractual payments from Apple even though the agreement clearly permits Apple to respond to the KFTC's lawful investigation and requests for information. If that were not enough, Qualcomm then attempted to extort Apple into changing its responses and providing false information to the KFTC in exchange for Qualcomm's release of those payments to Apple. Apple refused. Along with Qualcomm's most recent indiscretions, the lawsuit outlines questionable licensing strategy that goes beyond SEP licensing and component sales double-dipping. At the heart of the issue are secret manufacturer licensing agreements. Apple has been forced to pay fees for patents obscured by a legal shroud since 2007, when the first iPhone was released. When Apple selected the Infeneon (now Intel) baseband chip, Qualcomm required a licensing fee. The situation worsened when in 2011 Apple introduced an iPhone capable of connecting to CDMA networks, a technology dominated by Qualcomm chipsets. Instead of licensing directly to Apple, however, Qualcomm entered into a number of secret agreements with smaller contract manufacturers. Without bargaining power, these CMs pay "exorbitant" royalties on non-FRAND terms and pass the cost along to Apple. The process is hidden from Apple, meaning the company in many cases does not know what patents it is paying for its CMs to license. Apple as recently as last year attempted to negotiate direct licensing arrangements as certain agreements were set to expire at the end of 2016. Amid accusations of patent infringement, and in the face of heavy resistance by way of Qualcomm's increasingly litigious business strategy, those talks were largely unsuccessful. Apple is seeking unspecified damages in its suit against Qualcomm including the $1 billion in unpaid payments, as well as a disgorgement of non-FRAND royalties paid by Apple CMs. The lawsuit also looks to leave Apple unencumbered of certain cellular patents-in-suit, or alternatively assign a reasonable FRAND royalty rate.